So, there’s no doubt your Instagram feed is still being taken over by R.I.P posts for Nelson Mandela and Paul Walker. Its been a tragically sad week. But, you might have spotted the post above as well, especially if your following The Game’s IG. After hearing about two kids, under age 10, die from street shootings, the rapper decided to raise the white flag on gun violence in Los Angeles this holiday season. In the wake of 7 year old Taalib Pecantte ‘s murder along with 6 year old Tiana Ricks & all the other children slain this year due to gang violence in my city & on behalf of @therobinhoodproject we are asking all gangs to CEASE FIRE IN LOS ANGELES throughout the Christmas holiday season to ensure no more senseless child murders occur & families can enjoy their holiday season in peace. The rapper urged all his followers to re-post this message and hopefully those responsible for the senseless violence will take heed. If you remember, honestly, how can anyone forget? We are a week away from the one year anniversary of the Sandy Hook elementary school shooting. A day I believe will live in infamy and one that is being repeated over and over again, just in different scenarios, with younger faces and different locations. So, I salute The Game for continuing his Robin Hood Project initiative as well as being a peacekeeper in his community. And kudos to those passing the torch to their followers like P. Diddy, Khloe Kardashian, Monica, Xzibit, Shannon Brown and Kelly Rowland. 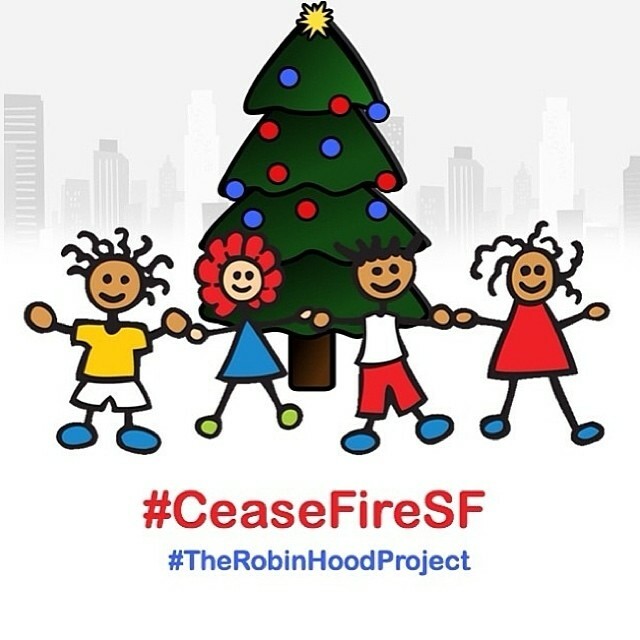 If you want to spread the love nationwide save the image above and post on Instagram using #Ceasefire and your city. IF U BL==NKED: The Game’s cause wasn’t the only one Ms. Kelly Rowland was getting behind (She’s becoming busier than Queen Bey these days). She’s taking her sassy act to Universal City Walk in Hollywood tomorrow to perform at a free concert for Rock the Red Kettle event that benefits The Salvation Army. Check out the video below to find out how else the newly engaged songstress is helping this historic org.